Transcelestial is re-imagining communications technology for the 21st century by creating the first ever, super fast space laser network which uses a constellation of nano satellites. Our network will transfer data 1000x faster than current radio wave technology for terrestrial, satellite and deep space applications. We are part of the inaugural batch of Entrepreneur First in Singapore, working under the patronage of SGInnovate. We have an incredibly fun and ambitious team who are looking for extremely motivated engineers and researchers. Our office is located in the heart of the business district, with a stone's throw away from the best pubs in town. We love people who challenge the status quo and show extreme grit and persistance. Join us, if you find space exciting, and define the rules for how our civilization grows and communicates! See the full JD here: https://sg.linkedin.com/jobs/view/274806975. Apply by emailing your solution to the below filter to irene.ling@lazada.com. Please have “[your name] - Regional Head of Data - HN” as the subject line. Here (http://i.imgur.com/ImdVZBI.png) is a simplified model of the systems used by a fictional online retailer. Their three systems track the flow of an order placed on their website, through their warehouse, and to the point of delivery. 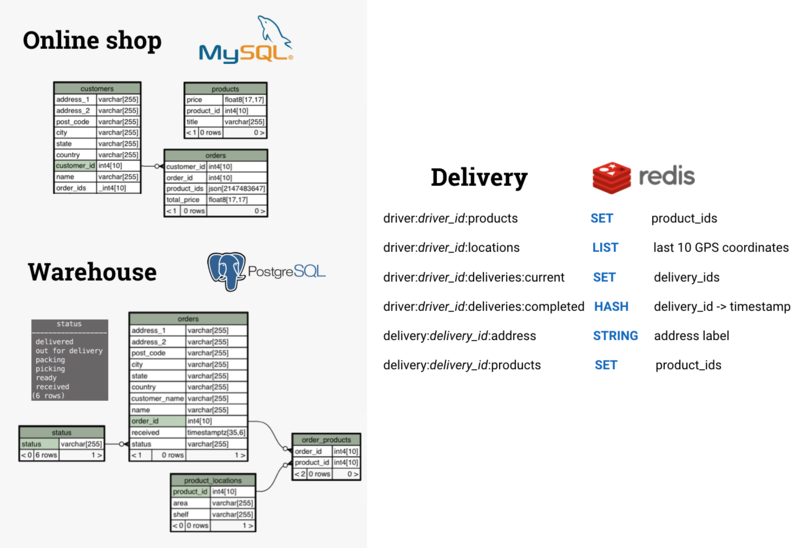 Each system uses its own database (MySQL for the shop, PostgreSQL for the warehouse, etc.). The systems communicate to each other via API calls (that are not shown here). Please review the model and be prepared to discuss it with us. When we talk, we'll ask you how you would answer queries about this fictional business. These will be high-level questions and not deeply technical. We'll also want to hear your opinion of the model, its limitations, and how it could be improved. 1. Write a query to count the number of products across all orders received by the warehouse system today (the PostgreSQL database). 2. Given an order_id, how would you find its last GPS coordinates? 4. Why do you think this fictional company chose Redis for their delivery system, and is it a good choice? If you are looking to join a fun, fast growing FinTech firm, keep reading. We were recently chosen by KPMG as one of 50 FinTechs to watch globally. Now in our 4th year, we are in over 40 UK universities, over 100 corporate locations and have a global presence with business in the US, Spain, Ireland and Singapore. The Yoyo Wallet product comprises of iOS and Android apps that talk to a suite of APIs powered by the Yoyo platform. We use a service-oriented architecture to support real-time, high-volume transactions that consistently deliver sub-one-second response times at the point-of-sale. We are hiring for Backend Engineers, DevOps, Android Engineers and iOS Engineers. * BACKEND STACK: includes (but is not limited to): Python, Django, Event messaging and RESTful APIs, Micro-Services Oriented Architecture, PostgreSQL, DynamoDB, RabbitMQ, Celery, Puppet, Fabric, Docker, CircleCI / Continuous Deployment via ChatOps, and is hosted on AWS. Carousell (http://carousell.com/app) is a mobile classifieds app that makes selling as easy as taking a photo, buying as simple as chatting. With over 57 million listings, we are one of the world’s largest and fastest growing marketplaces. Carousell began in Singapore and has spread to 19 cities around the world. Carousell has also been ranked as the top Lifestyle and Shopping app in Singapore, Taiwan, and Hong Kong and was awarded Google Play Best Local App 2016 in Singapore. Carousell is looking for a Backend Software Engineer to work on building the simplest buying and selling experience on our mobile application. Your responsibilities would be to: -Design and build scalable REST APIs for the Carousell marketplace platform. -Work with the Android, iOS, web, product and design teams to build innovative, robust, and easy-to-use features for our users. -Work with infrastructure team on performance profiling and optimisation. -Write clean, testable code with unit tests. -Participate in code reviews to maintain a high-quality code culture. TradeGecko | Singapore / Toronto | ONSITE https://tradegecko.com - we're building tools to power commerce companies, we get to help 10s of 1000s entrepreneurs build amazing businesses with tech. We want people that love understanding and helping businesses scale. We have 1 position open who will be working on our Inventory related products. The stack is in Haskell and React. Production experience in Haskell is not necessary, but a keen interest in functional tongues is required. We allow our engineers to work from home 2 days a week. No formal qualifications needed. Please email zan+hn@courex.com.sg if you are interested. We are passionate technologists who believe in the power of software and technology as tools for social change. The people in ThoughtWorks Singapore are as diverse in personality as we are in our backgrounds, culture, and expertise. As a polyglot technologist at ThoughtWorks, you'll get to think through hard problems in a consultancy environment, and work with amazing people to make the solutions a reality. You'll be working in a dynamic, collaborative, non-hierarchical environment where your talent is valued over your job title or years of experience. You'll spend your time building custom software using the latest technologies and tools in a highly hands-on capacity, usually in a pair-programming environment as we work with Agile Extreme Programming methodologies. You will craft your own career path here as we believe every individual is unique and there is no set path one must take to achieve one's career goals and aspirations. We are language agnostic, so we are not looking for anyone with expertise in a specific tech stack, as long as you've had at least 5 years of hands-on development and delivery experience in Java / C# / Ruby on Rails / Python / Node.js or any similar exciting technologies. You should possess great OO skills and strong design patterns knowledge, as well as a practitioner and advocate of software development best practices like Test Driven Development (TDD) and Continuous Integration (CI). If you relish the idea of being part of a community that extends beyond the work we do for our customers, you may find ThoughtWorks is the right place for you. If you share our passion for technology and want to help change the world with software, we want to hear from you! Data consumption is very different than it was twenty years ago, yet many enterprises still try to meet new requirements by using old concepts and paradigms. The iguazio Data Platform has fundamentally redesigned the entire data stack to bridge the enterprise skills gap and accelerate performance of realtime and analytics processing in big data, IoT and cloud-native applications. Backed by top VCs and strategic investors, the company is led by serial entrepreneurs and a diverse team of seasoned innovators in the USA and Israel. See http://iguaz.io/careers for full descriptions. Send your resume to careers@iguaz.io and mention Hacker News!